Short-lived pollution known as soot, such as emissions from diesel engines and wood-fired stoves, has about two-thirds the climate impact of carbon dioxide. The analysis has pushed methane, which comes from landfills and other forces, into third place as a human contributor to global warming. Black carbon, or soot, accelerates warming because the fine particles absorb heat when they are in the air and when they darken snow and ice. Although some lighter-colored fine particles can have a cooling effect because they block sunlight, other black carbon sources have a warming effect because they absorb it. 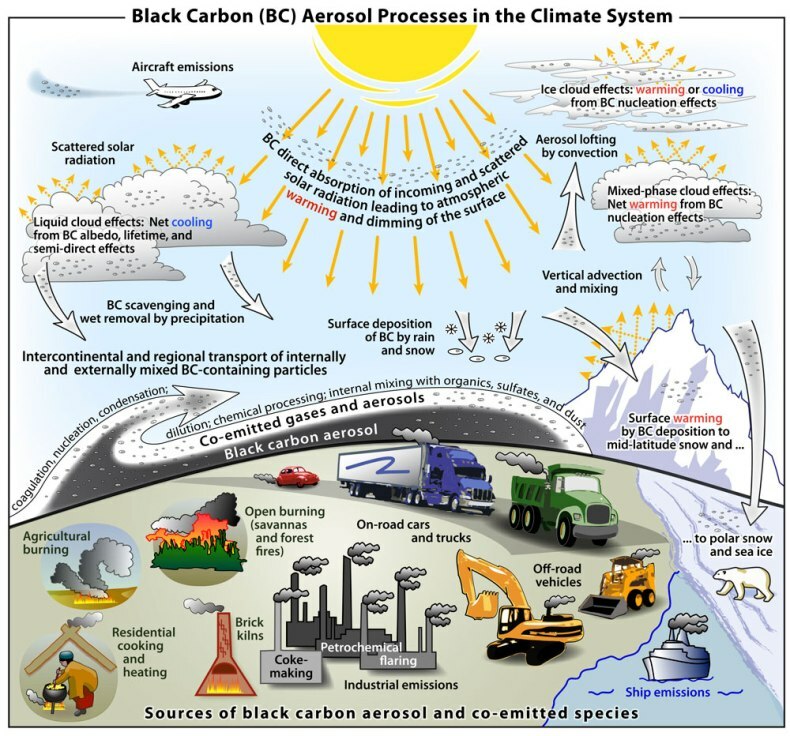 Black carbon (BC) is the most strongly light-absorbing component of particulate matter (PM), and is formed by the incomplete combustion of fossil fuels, biofuels, and biomass. BC is emitted directly into the atmosphere in the form of fine particles (PM2.5). BC is the most effective form of PM, by mass, at absorbing solar energy: per unit of mass in the atmosphere, BC can absorb a million times more energy than carbon dioxide (CO2). BC is a major component of “soot”, a complex light-absorbing mixture that also contains some organic carbon (OC). Most U.S. emissions of BC come from mobile sources (52%), especially diesel engines and vehicles. In fact, 93% of all mobile source emissions came from diesels in 2005. The other major source domestically is open biomass burning (including wildfires), although residential heating and industry also contribute. Through these mechanisms, BC has been linked to a range of climate impacts, including increased temperatures and accelerated ice and snow melt. Sensitive regions such as the Arctic and the Himalayas are particularly vulnerable to the warming and melting effects of BC. BC also contributes to surface dimming, the formation of Atmospheric Brown Clouds (ABCs), and changes in the pattern and intensity of precipitation. Reducing current emissions of BC may help slow the near-term rate of climate change, particularly in sensitive regions such as the Arctic. •BC’s short atmospheric lifetime (days to weeks), combined with its strong warming potential, means that targeted strategies to reduce BC emissions can be expected to provide climate benefits within the next several decades. BC contributes to the adverse impacts on human health, ecosystems, and visibility associated with ambient fine particles (PM2.5). Short-term and long-term exposures to PM2.5 are associated with a broad range of human health impacts, including respiratory and cardiovascular effects as well as premature death. Over the past decade, the scientific community has focused increasingly on trying to identify the health impacts of particular PM2.5 constituents, such as BC. However, there currently is insufficient information to differentiate the health effects of these constituents; thus, EPA assumes that many constituents are associated with adverse health impacts. The limited scientific evidence that is currently available about the health effects of BC is generally consistent with the general PM2.5 health literature, with the most consistent evidence for cardiovascular effects. EPA’s latest Integrated Science Assessment for Particulate Matter provides more information. In the United States, the average public health benefits associated with reducing directly emitted PM2.5 are estimated to range from $290,000 to $1.2 million per ton PM2.5 in 2030. The cost of the controls necessary to achieve these reductions is generally far lower. Globally, PM2.5, both ambient and indoor, is estimated to result in millions of premature deaths worldwide, the majority of which occur in developing countries. The World Health Organization (WHO) estimates that indoor smoke from solid fuels is among the top ten major risk factors globally, contributing to approximately 2 million deaths annually. Women and children are particularly at risk. For more information about resources and expertise to reduce smoke exposure from cooking and heating practices in households around the world, please visit the Partnership for Clean Indoor Air . Ambient air pollution is also a significant health threat. For more information on these risks, visit the WHO's full Global Burden of Disease report (PDF) (70 pp, 3.6 MB, about PDF). PM2.5, including BC, is linked to adverse impacts on ecosystems, to visibility impairment, to reduced agricultural production in some parts of the world, and to materials soiling and damage.